It was a picture-perfect, cool and sunny spring morning when dozens of cyclists left their cars at home and rode their bikes to work in Media instead in celebration of Bike to Work Day. On Friday, May 17, the Delaware County Transportation Management Association (DCTMA) and the Delaware County Planning Department partnered up for Bike to Work Day, drawing County employees and other bicyclists from as far away as Upper Darby. Cyclists enjoyed refreshments during the morning celebration held outside the County Courthouse. Franklin Mint Federal Credit Union was the main sponsor with Wawa, Trader Joe’s, and Main Line Water providing water, orange juice, and fresh fruit. Participants also entered into a special raffle for prizes donated by local businesses. 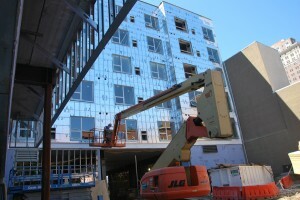 Thanks to all those who attended LGBT-Friendly Senior Housing in Philadelphia: Creating the John C. Anderson Apartments. The session PowerPoint presentations are linked to in the program description below and are all available from this download folder. Thanks again for coming and we thank you for your feedback. We will be releasing a recording of this session as well, which will be advertised from this blog. 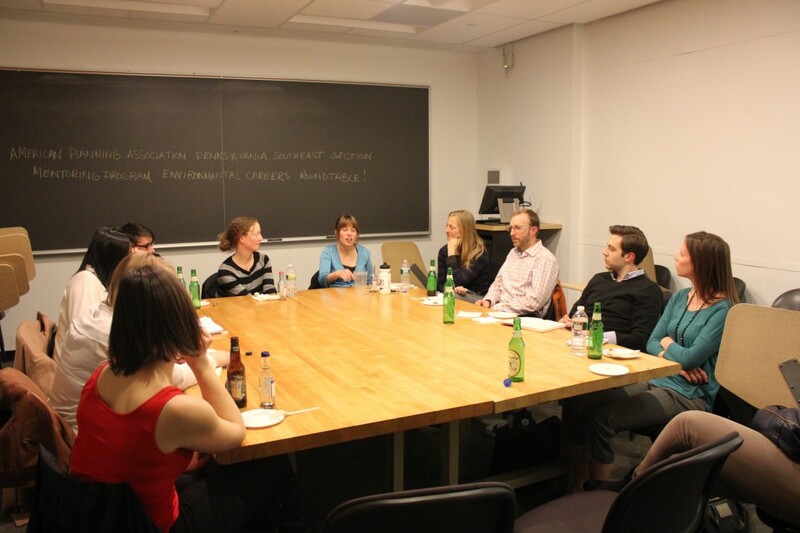 On Friday, April 5 the APAPASE Mentoring Program held a professional roundtable discussion at PennDesign focused on Environmental Careers. Professional guests included Kathleen Grady, Director of Sustainability at Temple University, Chris Linn, Senior Environmental Planner at the Delaware Valley Regional Planning Commission, and Emily Linn, Environmental Protection Specialist at U.S. Environmental Protection Agency. The informal discussion was moderated Jeannette Brugger, Pedestrian, Bicycle and Open Space Planner at the Philadelphia City Planning Commission. 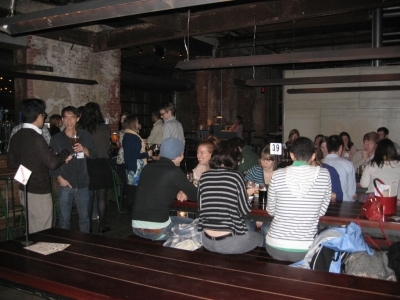 On Tuesday, November 13, 2012, forty planners converged on Frankford Hall in Fishtown for APAPASE’s November Happy Hour. Practicing planners from the public, private, and non-profit sectors and planning students mingled over half-liter steins of beer and pretzels at Stephen Starr’s Bavarian biergarten-inspired restaurant. While the happy hour officially lasted from 5:30 to 7:30pm, a dozen or so people stayed to enjoy the outdoor firepit in the restaurant’s interior courtyard. 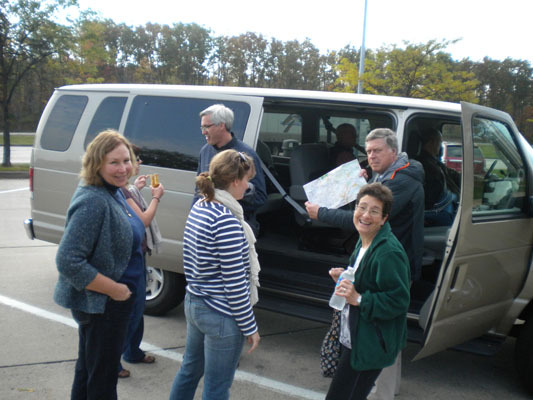 Eleven planners from the Southeast section decided to carpool to the APAPA conference in Erie, PA between October 14 and 16, 2012. 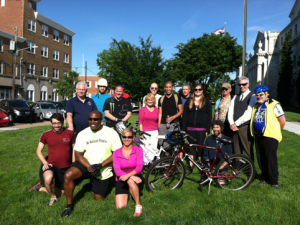 We arranged to meet at the West Conshohocken Park and Ride lot at 6:30 am on Sunday morning. 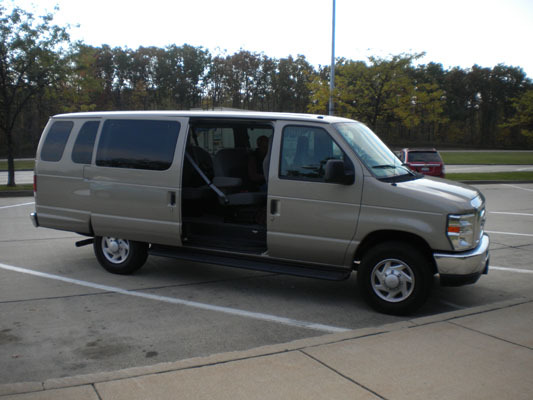 We loaded our belonging into the 15-passenger rental van, and headed out on the road. Although it was still dark out, the mood was jovial and the conversation flowed as people got to know each other. There was a quick stop for coffee at a rest-stop on I-476, as well as another quick stop at the Snow Shoe rest-stop along I-80. 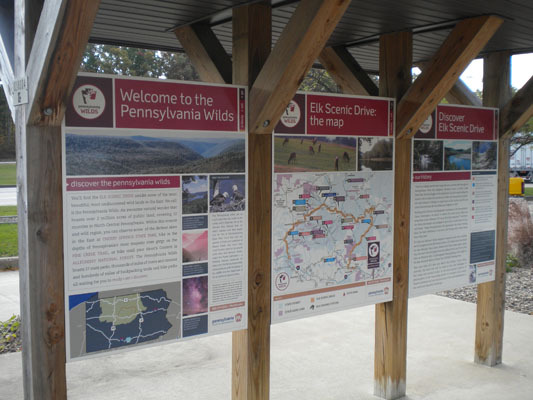 The Snow Shoe rest-stop is in the Pennsylvania Wilds. 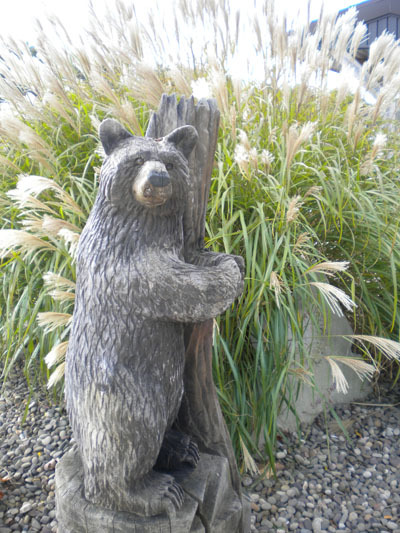 The PA Wilds is a strategic effort by a multitude of organizations to grow the nature and heritage tourism industry in 12 ½ rural counties in the northern-central portion of Pennsylvania. The goal is to create jobs, diversify local economies, and improve quality of life while inspiring a stewardship ethic in residents and visitors. 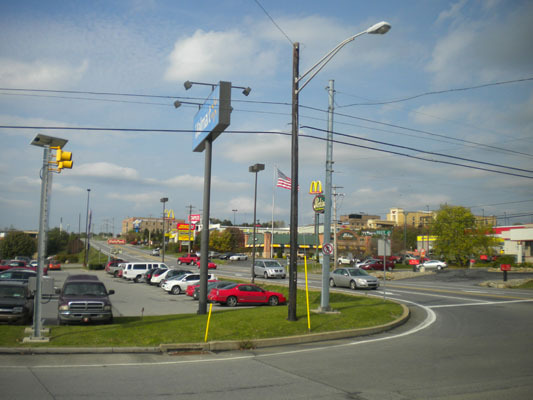 By midday, we had made it to Clarion, Pennsylvania. We decided to pull off the highway and eat lunch. Faced with a plethora of fast food options, we chose Eat’nPark, which advertised that its salad bar included 10% local produce. 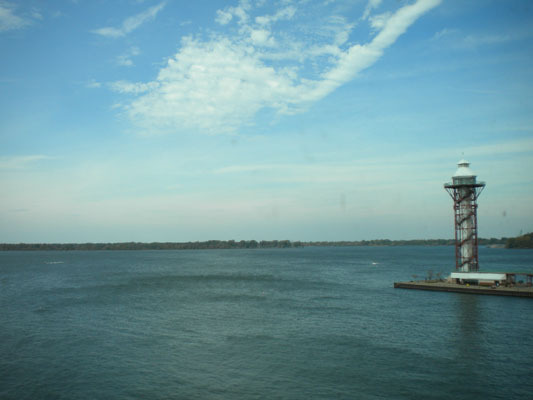 We arrived in Erie at approximately 2:30pm–eight hours after we started our journey on the outskirts of Philadelphia. 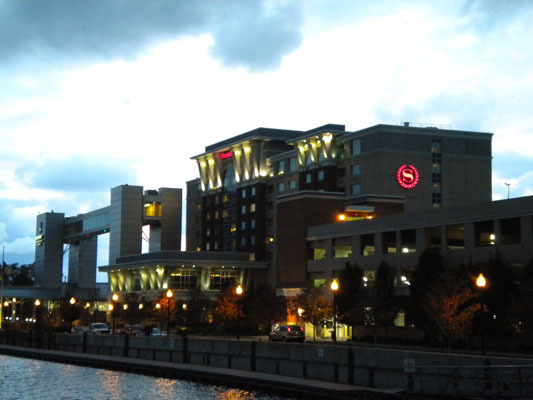 Our first stop was checking in at the Sheraton Erie Bayfront Hotel, a 200-room hotel that is the area’s first waterfront hotel. 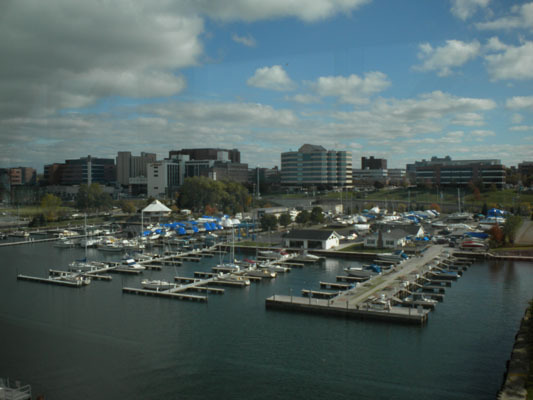 The northern side of the hotel offered views of Presque Isle, while the southern side offered views of the marina and downtown Erie. 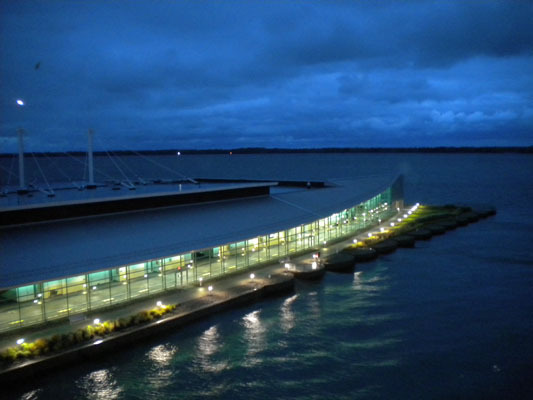 The hotel was connected via a skybridge to the Bayfront Convention Center. Due to our long journey, we had missed the first session of the conference, but we got there in time for the second session. 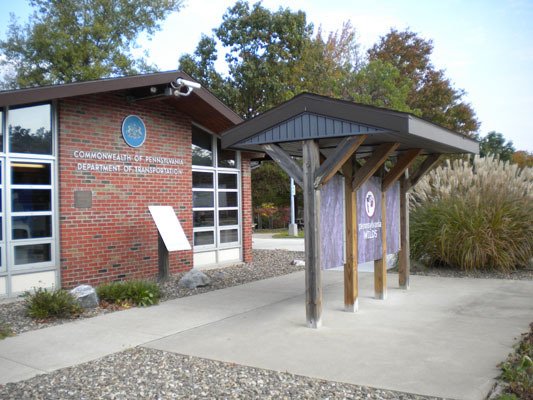 On Sunday evening, there was a reception at the Tom Ridge Environmental Center. 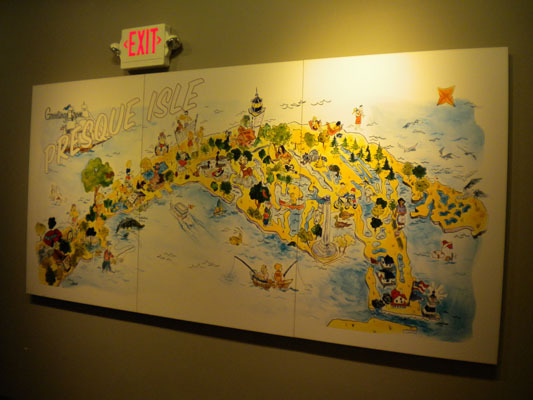 While enjoying hors d’oeuvres, we were able to view the interactive exhibits about Presque Isle’s unique ecosystem. 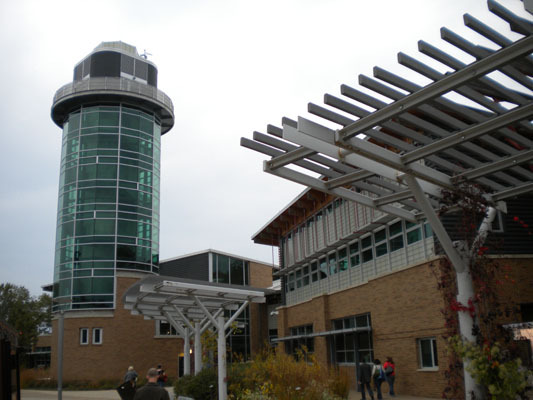 Although it was already fairly dark when we arrived, many planners made the trip up the observation tower to see the view of Lake Erie. 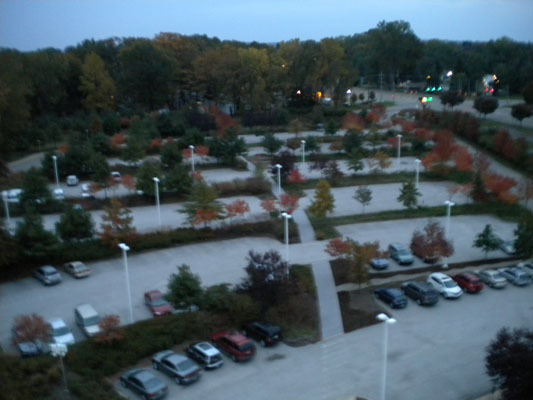 There was also a good view of the parking lot, which included many stormwater management features. On Monday, we attended educational sessions at the conference, including a keynote by Tony Hiss, author of The Experience of Place and In Motion. 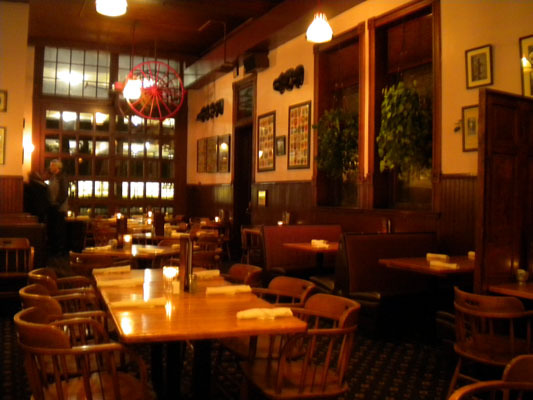 On Monday evening, we enjoyed dinner on our own in downtown Erie. We ended up at a restaurant called Pufferbelly, which is in a converted fire station. 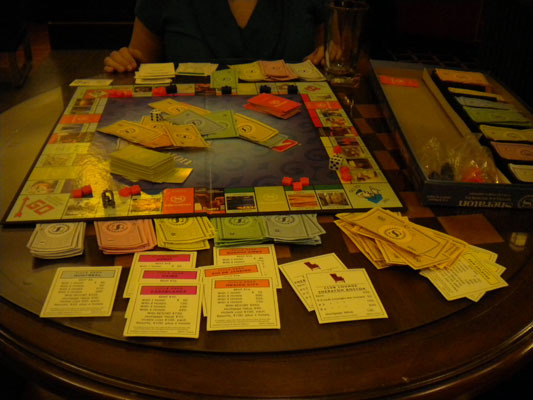 Several planners enjoyed a game of Monopoly in the hotel lobby after dinner. 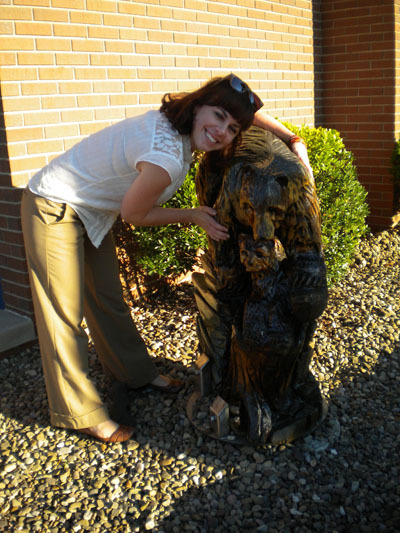 On Tuesday, there were additional educational sessions, as well as the Awards Luncheon. 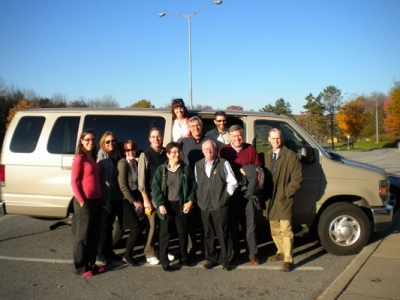 Multiple members of our van won raffle baskets as part of a fundraiser for the Pitkin and Spaulding Scholarship Funds. At 2:30pm, we headed back to our van for the trip back to Philadelphia. 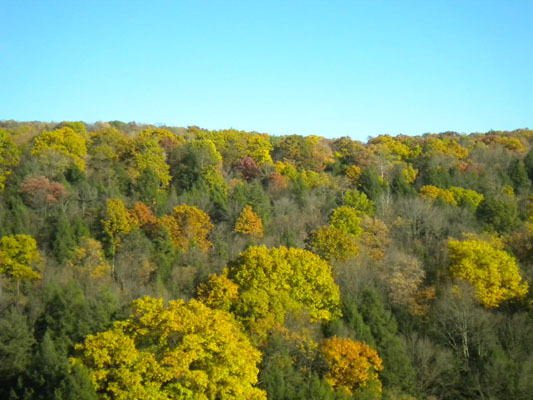 The weather was bright and sunny, allowing us to marvel at the fall foliage in the Allegheny Mountains. We stopped at the Twilight Diner in Loganton, PA for dinner. Overall, the trip was a lot of fun and very cost-effective (only $39.14 per person, after a $300 subsidy from the APAPASE chapter). We got to know each other better and learned a great deal as well. 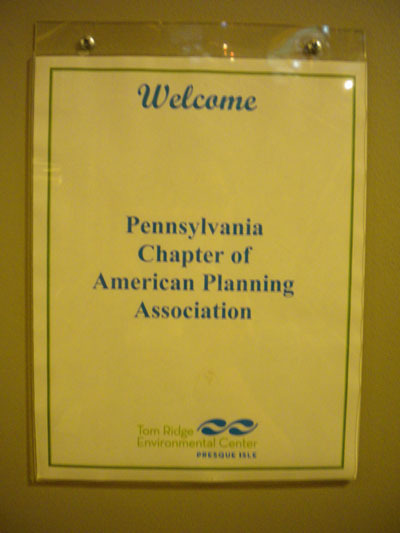 Thanks to all those who attended the Making Energy Planning Work Professional Development Institute Session (PDI). As promised, the session powerpoints are linked to in the program description below and are all available from this download folder. Thanks again for coming and we thank you for your feedback.